So you've decided that "Light is Right" and purchased a set of tech boots and bindings for a lighter weight ski touring option. They're mounted up and ready to go, but you've never actually stepped into them… and dang, they seem so tiny. Relax. Lots of people have gone through the tech binding initiation process and survived to tell the tale. Tech bindings have a short but steep learning curve. Here are a few hints to help familiarize yourself with your new bindings. 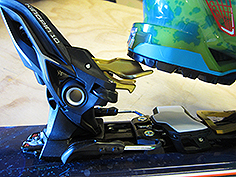 You’ll need tech toe and heel fittings like these to use tech bindings. 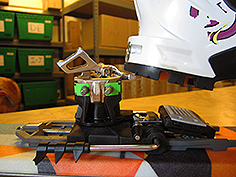 Tech bindings, sometimes known by the brand name Dynafit but now produced by many companies, are ingenious, lightweight alpine touring bindings that rely on two sets of precision-machined pins to hold the toe and heel of your boot in place. The binding must be used with a special boot equipped with metal pin sockets molded into the toe and a screwed-on heel plate with deep molded indents in the heel. While skinning uphill, your toe is held in place by only the two front pins; when you want to descend, you step down to engage the two rear pins (or heelpiece cup) and lock the heel down. 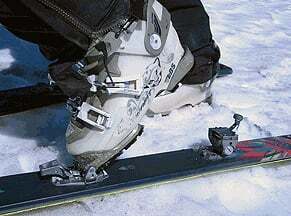 The rigid sole of your ski boot acts as the frame between the toe and heel piece, saving considerable weight. 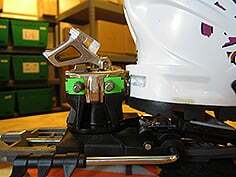 Tech bindings have only a fraction of the mass of alpine bindings. People who haven’t used them sometimes find it hard to believe they’ll be reliable in the backcountry, but strong skiers have used them successfully in some of the most severe conditions on the planet, and chances are you can too. 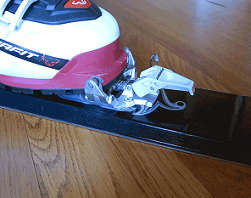 Get familiar with the operation of your tech bindings on the carpet at home before your first outing. Practice clicking in and out, locking the toe lever, and using the different climbing levels. A bit of dry land practice will help when you try them on snow for the first time. After your bindings are mounted, check the lateral alignment of the boots (not while wearing them) by clicking the toes into the toe pieces and raising and lowering the heels a few times. With the heels in "ski" position (pins facing forward), the heel plate slots in your boots should line up perfectly with the pins. A millimeter or so to either side is okay, but the pins shouldn't hit any rubber sole material as they slide into the slots. If they don't line up properly, a qualified ski shop can sometimes correct the alignment by loosening the screws and re-tightening them in different sequences. 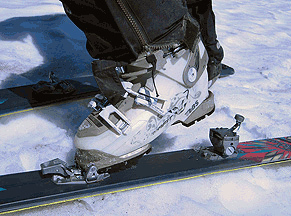 Check the gap between the boot heel and heelpiece with the boot clicked into “ski” position. This gap must be set accurately for the binding to function properly. 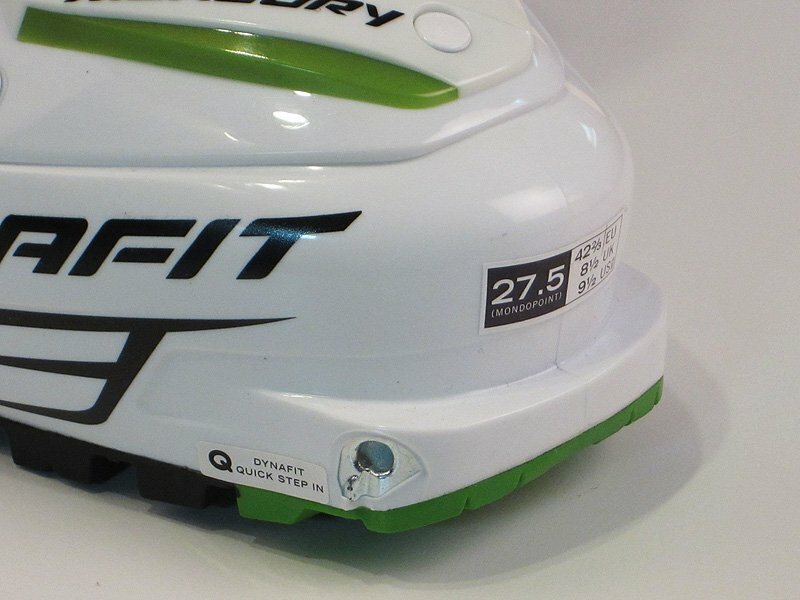 The Dynafit Speed Radical and Speed Turn models require a 5.5 mm gap, while some other models and brands (Atomic Backland/Salomon MTN, for instance) require 4.0 mm spacing. Older Vertical and Comfort models, which originally specified a 6 mm gap, should also be set to 5.5 mm. 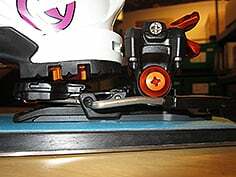 Newer bindings with heel elasticity should have zero to .5 mm gap - the Dynafit Radical 2.0 series, for example, use this negligible "kiss" gap (see photo below right), as do the G3 Ion and Fritschi Vipec. The Marker Kingpin, Salomon/Atomic Shift and Fritschi Tecton do not use heel pins to secure the rear of the boot, and each model has its own specific forward pressure setting. Gap or forward pressure is critical to the proper function of your tech bindings; ask a certified technician if you are uncertain about how to check this. Dynafit gap tools. New (above) is correctly compressed to 5.5 mm in photo, old version is 5.5 mm between the raised bumps. Dynafit 2.0 Heel gap - just touching. Tech bindings require a bit more skill to put on than regular step-in ski bindings, but you'll get the hang of it with a little practice. There are several common ways of getting into a tech toe, including stepping straight down, as well as engaging one toe pin first, then rolling the boot flat so the other toe pin clicks in. Some people prefer to position their boots against the heelpiece first, then step down on the toe, and many people use different techniques depending on the situation. Certain boots come with toe alignment markers molded into the toes. If you don’t have these you can draw marks directly over the toe sockets on your boots with a Sharpie so you know where the toe piece pins should line up, and your skill at stepping into tech toes will increase quickly with a few practice sessions. After the toe piece arms close and the pins are in the boot sockets, gently raise and lower your boot heel a few times to "seat" the pins. If there is snow or debris in the way, this action will cause the pins to bore into the sockets and force extraneous matter out. If you want to ski, twist the heelpiece so the pins face forward and step down hard so the pins click into the slots in the heel of your boot. Boot alignment marks - you can draw these yourself. Move your boot heel up and down a few times after stepping in. Note: Atomic Backland/Salomon MTN, Dynafit Beast, Marker Kingpin, Fritschi Vipec and Tecton heels do not need to be rotated to switch between ski and tour modes, but move back on a track to clear the boot heel or simply remain with pins forward-facing while skinning. The Salomon/Atomic Shift toe "transforms" to an alpine-like unit for the downhill and the heel does not move. 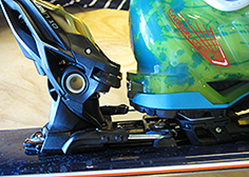 It’s normal for the boot to be suspended above the ski supported only by the rear set of pins when in ski mode, especially in bindings without a ski brake. It might look precarious, but it’s the way the binding is designed to work. 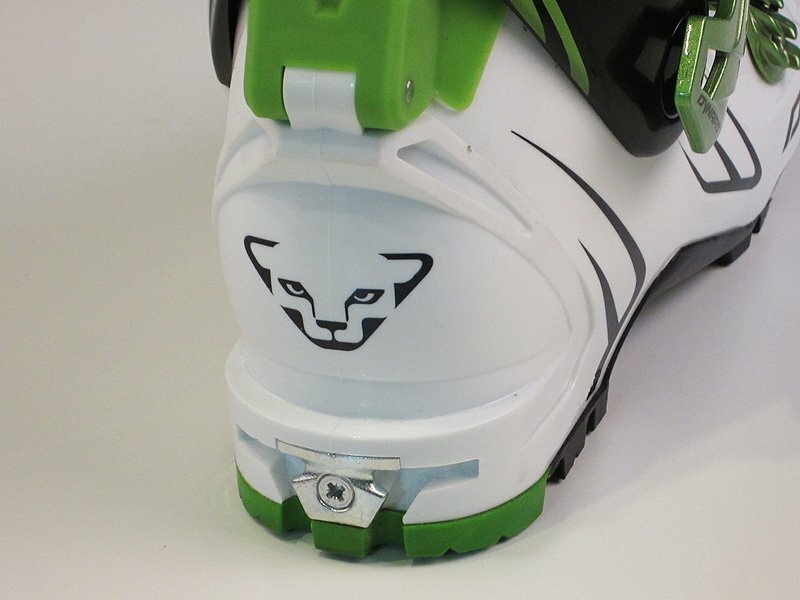 Tech bindings with ski brakes will typically have a moving AFD (Anti-Friction Device) located under the heel of the boot that fills up this space. If you want to skin, click into the toe, making sure the heel is turned to the climbing position if needed. Then "lock" the toe into the climbing position by pulling up on the toe lever until you hear an audible click (or series of clicks, depending on the binding). If you don't hear the click(s) or see the word "Walk" on the lever base (Fritschi) , it could mean you have dirt, ice or snow blocking the system, either in the pin/socket interface or under the toe arms. Take the ski off and check. Using the binding for skinning without fully locked toes can result in the ski releasing when you don’t want it to. Note: Some brands or models of tech bindings have toes that go into lock mode automatically when you step in, or a smooth locking lever that produces no clicks. If you own these bindings, you need to be aware of their quirks. 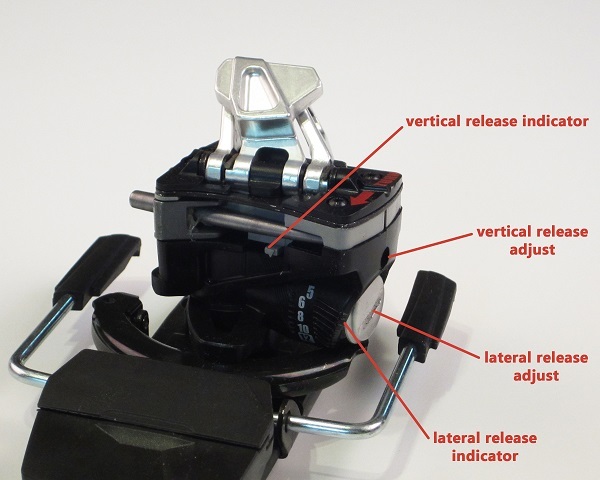 All tech manufacturers recommend that you unlock the toes (so the lever is down and parallel to the ski) for skiing, and lateral release values are calculated with the lever in this position. Skiing with the toe lever in the locked position increases the force needed for a lateral release, but does not affect forward release. 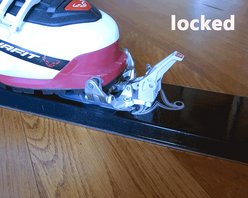 If you ski with your toes locked, you risk unreliable lateral release when you need it. Dynafit Radical toe in locked (touring) position. Dynafit Radical toe in unlocked (ski) position. 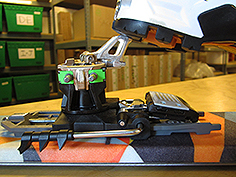 Though most tech bindings have adjustable release values and use a set of numbers that appear to mirror alpine binding DIN settings, there is currently no tech-specific industry standard for certifying them. 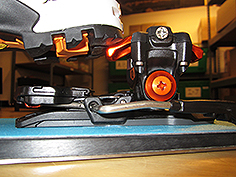 Some tech bindings, including many with fore/aft heel elasticity, conform to the alpine touring binding standard ISO 13992, while many have not been certified to any existing binding standard. Users should not assume their tech bindings will perform like a similarly adjusted alpine binding, and proceed accordingly. 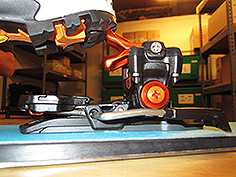 On traditional tech bindings, both vertical (forward) and lateral (sideways) release values are set at the heelpiece, but with separate screws. 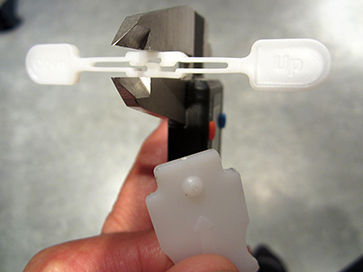 Release value numbers are printed on the heelpiece body; vertical release is indicated by the moving plastic tab at top while lateral release is indicated by where the sharp edge of the metal cap lines up with the markings (see photo). Exceptions are the Fritschi Ion and Tecton bindings, which are adjusted for lateral release value at the rear of the toepiece. Atomic Backland/Salomon MTN release values are adjusted by swapping the "U" spring in the heelpiece and the upward and lateral functions can't be separated. Most ultralight race-type tech bindings have no release value adjustment. 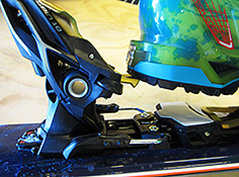 In practice, tech bindings may perform differently than alpine bindings during release, especially in the forward (vertical) plane. Elasticity may also not be the same as alpine bindings, so be aware that your tech binding may not offer the same level of retention in extreme conditions. If in doubt, work up to high speeds and air gradually. Learning curve aside, most people who transition to tech bindings find that the light weight and smoothness of operation while skinning improve the overall ski touring experience immensely, and we’re guessing you will too. Check that the toes are aligned properly and the heel pins engage correctly. Spray under the toe arms periodically with silicone spray to reduce snow and ice buildup. Raise and lower the heel of your boot a few times when engaging the toe to make sure the interface is clear of debris. Make sure your toes are fully "locked" before skinning. If the toe won’t lock fully, check for debris in the boot toe sockets or under the binding toe arms. If ice does collect under the toe arms, hold the ski upright and snap the toe open and closed a few times without the boot to remove it (wear gloves so your fingers don’t get pinched). If this isn’t enough to break up and remove the ice, use a multi-tool or similar pointed object to get it out. Forward (vertical) and lateral (horizontal) release values are normally set with different screws, and are not necessarily equal to alpine DIN values with the same number. Start with release values that are familiar, and be prepared to adjust them if needed. Dynafit Radical, Radical 2.0 and Rotation heels are only meant to be rotated in a clockwise direction – turn them ¼ turn to skin, then another ¾ turn in the same direction to return to ski position. The exception is the Dynafit Speed Radical with external anti-rotation tab, which should be rotated counterclockwise back to touring position rather than forcing the heel over the tab (disregard the arrow on the heel top plate). 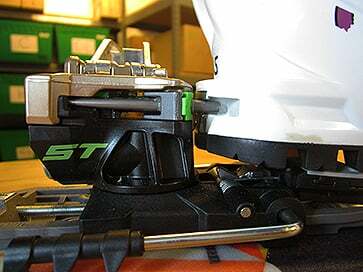 Dynafit Turn heels are designed to be rotated with the tip of a ski pole inserted into the riser “volcano” (Radical heels are not) but proper technique is important to avoid breaking the top plate. Use an arcing motion rather than pulling straight back on your pole. Dynafit Beast, Marker Kingpin, Fritschi Vipec/Tecton and G3 Onyx heels move rearward rather than rotating for skinning. Atomic Backland/Salomon MTN heels may be left with pins facing forward to skin. G3 ION and Zed heels may be rotated in either direction, and the lifters function equally in either posiiton. Salomon/Atomic Shift toepieces convert to an alpine style toe for skiing; the heel unit does not move. 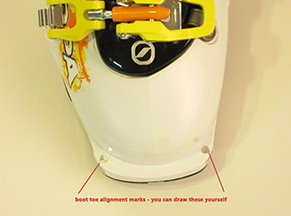 The binding is not designed for skiing with the toe in "tech" mode. Slide your feet along the snow surface for efficiency rather than picking them up. When it gets steep or you start to slip backwards, keep your weight back on your heels for better traction. Stand up straight and think about "pulling up your toes." This isn’t intuitive for most people, but it works. Keep your angle of ascent moderate and consistent whenever possible. If you’re following, stay in the skintrack and take your turn breaking trail when the leader gets tired. Use your climbing lifters when it gets steep. Using them puts less strain on your hamstrings and helps pressure the back of the ski for better traction. Learn and practice your uphill kickturn technique, starting with mellow terrain and working up to steeps. Kickturns on 45˚ slopes in two feet of powder are half Tai Chi and half ballet, but still faster than bootpacking. When transitioning in deep snow, pack out a flat area and take off only one ski at a time to maintain a solid platform.